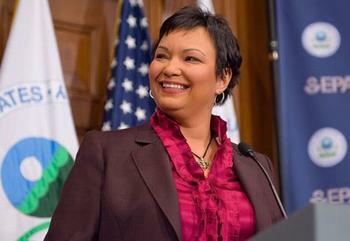 WASHINGTON, DC, December 27, 2012 (ENS) – Lisa Jackson, who has headed the U.S. Environmental Protection Agency during President Obama’s first term in office, is leaving the Cabinet after four years in which she regulated pollution over the objections of Congressional Republicans and industry. Jackson announced her resignation today in a statement in which she put the date of her departure after the President’s 2013 State of the Union address, usually scheduled for the end of January. “I want to thank President Obama for the honor he bestowed on me and the confidence he placed in me four years ago this month when he announced my nomination as Administrator of the Environmental Protection Agency,” said Jackson today. Environmental leaders congratulated Jackson on her record of achievement and wished her well. Jackson made seven issues the priorities of her administration and made big strides towards accomplishing her goals over the opposition of Congressional Republicans and the fossil fuel and manufacturing industries. Building on the U.S. Supreme Court’s 2007 decision in Massachusetts v. EPA, the most influential climate change court ruling to date, Jackson brought greenhouse gases under federal regulation by declaring in December 2009 that they endanger public health and the environment – the so-called endangerment finding. The endangerment finding also concluded that the greenhouse gases emitted from new motor vehicles contribute to climate change pollution, which gave rise to emission standards for light duty motor vehicles in model years 2012-2016. They were issued by EPA in May 2010 and took effect on January 2, 2011. Using the same authority, Jackson and the Obama Administration finalized vehicle fuel economy rules that will raise the average fleet standard to 54.5 miles per gallon by 2025. “In all of this, we must also recognize that climate change will affect other parts of our core mission, such as protecting air and water quality, and we must include those considerations in our future plans,” Jackson said. Jackson’s EPA also determined that the Clean Air Act required major stationary sources of greenhouse gases, such as power plants and factories, to obtain construction and operating permits. Most recently, on December 21, the EPA finalized changes to Clean Air Act standards for boilers and certain incinerators that will achieve extensive public health protections by slashing air pollution, including mercury, toxic metals, acid gases and particle pollution, while addressing feedback provided by industry and labor groups, increasing the rule’s flexibility and dramatically reducing costs. As a result, 99 percent of the approximately 1.5 million boilers in the U.S. are not covered or can meet the new standards by conducting periodic maintenance or regular tune-ups, the EPA said announcing the new standards. On December 14, in response to a court order, the EPA finalized an update to its national air quality standards for harmful fine particle pollution (PM2.5), including soot, setting the annual health standard at 12 micrograms per cubic meter. By 2020, ninety-nine percent of U.S. counties are projected to meet revised health standard without any additional actions, Jackson said then. Jackson finalized stronger ambient air quality standards for ground-level ozone, which will help millions of Americans breathe easier. On July 6, 2011, the EPA finalized the Cross-State Air Pollution Rule, which requires states to improve air quality by reducing power plant emissions that contribute to ozone and/or fine particle pollution in other states. Under Jackson the EPA developed a comprehensive strategy for a cleaner and more efficient power sector, with strong but achievable emission reduction goals for sulfur dioxide, SO2, nitorgen oxides, NOx, mercury and other air toxics. The Jackson EPA also strengthened ambient air quality standards for pollutants such as particulate matter. Pending are new coal combustion residuals and cooling water intake structures regulations. “One of my highest priorities is to make significant and long overdue progress in assuring the safety of chemicals in our products, our environment and our bodies,” Jackson said at the beginning of her second year in office. Jackson wrote principles for modernizing the Toxic Substances Control Act, and shifted EPA’s focus to address high-concern chemicals and fill data gaps on widely produced chemicals in commerce. At the end of 2009, EPA released its first chemical management plans for four groups of substances and streamlined the Integrated Risk Information System focusing on peer-reviewed health assessments for dioxins, arsenic, formaldehyde, TCE and other substances of concern. Under Jackson the EPA created the Design for the Environment Alternatives Assessment Program with chemical suppliers, product manufacturers, and non-government organizations. The program helps industries choose safer chemicals by providing a detailed comparison of the potential public health and environmental impacts of chemical alternatives. For instance, to identify substitutes for a toxic flame retardant chemical known as decabromodiphenyl ether (decaBDE), last June the EPA released a draft report on alternatives under the Design for the Environment program. Developed with public participation, the report documents the environmental and human health hazards on 30 alternatives to decaBDE, which will be phased out of production by December 2013. DecaBDE is a common flame retardant used in electronics, vehicles, and building materials. It can cause adverse developmental effects, can persist in the environment and can bioaccumulate in people and animals. In 2009 EPA made cleanup progress by accelerating the Superfund program and confronting local environmental challenges like the asbestos Public Health Emergency in Libby, Montana and the Tennessee Valley Authority’s coal ash spill in Kingston, Tennessee. In 2011, the agency increased by 10 the total number of sites where EPA actions have controlled a potential or actual exposure risk to humans, meeting the annual target of 10 and bringing the program’s total to 1,348 Superfund sites where exposure is under control. In 2010, the EPA increased these controlled sites by 18. Also in 2011, the EPA increased by 21 the total number of sites where agency actions have controlled the migration of contaminated ground water, exceeding the target of 15 for the year and bringing the program’s cumulative total to 1,051 Superfund sites where contaminated groundwater migration is under control. In 2010, the EPA also increased these controlled sites by 18. In September 2012, the Superfund program released a National Strategy to Expand Superfund Optimization Practices from Site Assessment to Site Completion. The goals of the strategy are to expand and formalize optimization practices as an operating business model for the Superfund remedial program. Jackson also focused on protecting water quality, working for environmental justice and building strong state and tribal partnerships. A chemical engineer by profession, Jackson was employed by the EPA for 16 years before she worked with the New Jersey Department of Environmental Protection, first as assistant commissioner and then as commissioner. President Obama recruited her from the New Jersey DEP to head the U.S. EPA. Jackson lives with her husband, Kenny Jackson, and their two sons in East Windsor, New Jersey.